The 2018 Community Social Assessment has told us a lot about our town, the people who live here, and the things we want for the future. By using information residents told us during the community conversations, and demographic information from Statistics Canada, we can better plan programs and services for the future. The average Banffite is now 35 years old. Our median age used to be 29, but has gone up in recent years. People aged 20-29 make up less of our population (dropping from 28% to 23%, from 2006 to 2016) and people aged 50+ make up a bigger portion of our population (going up from 19% to 25%, from 2006 to 2016). People aged 30-49 are the largest population group in our community with 36%. A growing number of people are coming to Banff for jobs, not mountain sports. It’s a change we’re seeing as demographics change. Also, business hiring strategies are targeting people from different parts of the world, who don’t tend to participate in mountain sports. Indoor and outdoor community hubs are in demand by all sectors of our population. People want to have more indoor activities and places to hang out in the winter, and more neighbourhood outdoor picnic and BBQ spaces in the summer. It’s still difficult to find a place to live in Banff, and one-third of our households spend approximately 30% of their total income on housing costs. 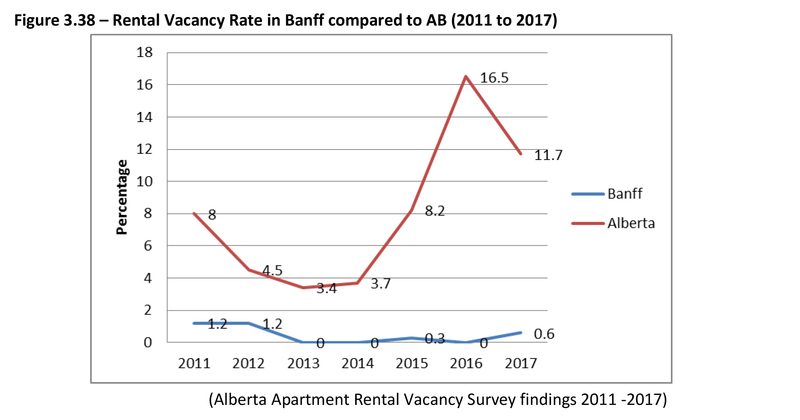 As of 2017, our rental property vacancy rate is 0.6%. A healthy rate is between 3% and 5%. Vacancy rates for 2018 are still being compiled, so it’s too early to tell if initiatives like Ti’nu, the Town’s new 131-unit apartment complex, have had any impact on rental vacancy rates. Single moms in Banff make approx. $19,000 less than single dads. It’s the biggest gender/income disparity in our community. It’s important to be aware of this statistic, because 75% of all lone parent households in Banff are led by women. This kind of imbalance is seen almost everywhere, so Banff is no different than other communities in this respect. 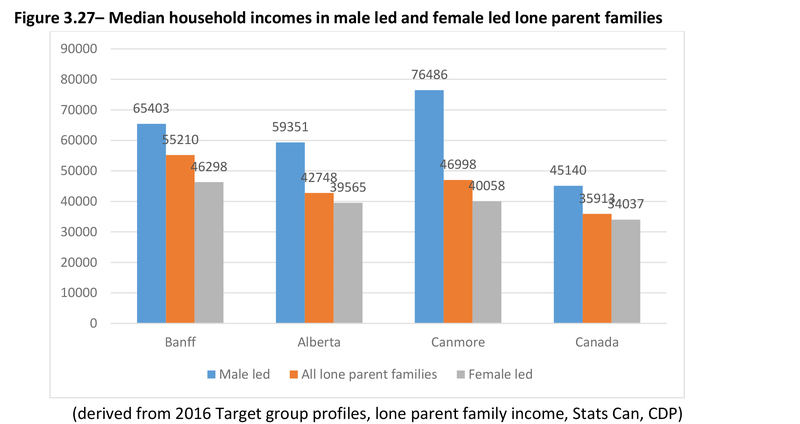 Despite the gap in pay between single moms and dads, overall Banff has the least amount of gender/income difference when compared with other resort communities, the province, and the country. 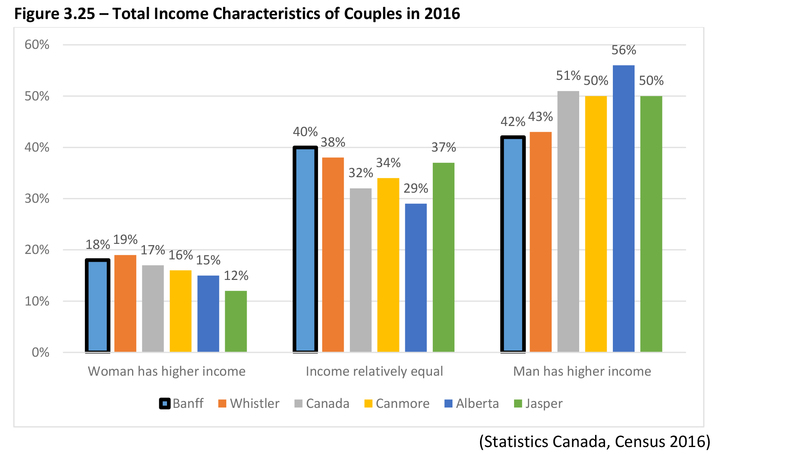 In Banff, you’re more likely to see equal incomes across genders, and a larger percentage of couples (18%) where the woman makes more money. However, typically men still make more money than women. Charitable giving is important to Banffites. In 2016, we donated over $1.7 million (as reported on taxes), up from $1.6 million in 2011. Of that amount, $1.1 million was donated by people earning over $80,000 per year, and $453,700 was donated by those earning between $20,000 and $60,000 per year. On average, Banffites claimed $360 in charitable donations on taxes. The national average is $300 per person. Banffites have a lot of formal education – much higher than the provincial and national average. Looking at Banff residents 25 years and older, 73% have a postsecondary certificate, diploma or degree. The average in Alberta for that age range is 55%, and nation-wide, it’s 65%. Seeking higher education is a trend we’ve seen over time. From 2006-2016, the number of people 25 and over with a university degree or diploma has increased from 27% to 35%. There’s a huge sense of pride for our community’s high standards in environmental stewardship. Residents want to maintain these high standards for the environment, wildlife conservation, renewable energy, plastic use and waste management. There’s also a desire to share these values with the visitors to our community. The employment rate for residents 15 to 24 years old has dropped from 86% to 72% over a 10-year period from 2006-2016. For seniors (aged 65+) the employment rate has gone up – from 19% to 27%. For those 25 to 64 years of age, the employment rate has remained stable over the past 10 years at 89%. Around 34% of Banff’s total population is made up of people born in another country. The top five countries of origin are the Philippines, Japan, the UK, India, and South Korea. Tagalog is the more predominate non-official language spoken at home by immigrants. Residents spoke about how busy life was in Banff and how there was no downtime or “shoulder season” anymore. There’s a general sense people are working more and struggling with lower paying jobs. It seemed to be affecting the quality of life and sense of belonging. Residents expressed concern about traffic congestion and the need to educate visitors more about wildlife, recycling and waste management. Despite the challenges of living in Banff, overall residents expressed their love for the town, mountain environment and numerous “big city” amenities available in the area (transit, museums, Banff Centre) that still had a “small town” feeling (walkability, safety, friendliness). People are also very happy with the programs and services available locally, and that they’re better informed about what’s happening in town.